Seeing LED light bulbs in your local hardware store, you may think "why on earth would I pay that much for an LED light bulb." However, when an analysis of the cost of the electricity and bulb replacement costs are done, it is rather surprising just how much money an investment in a more expensive LED light bulb will save long term. Lifespan assuming 3.0 hours per day usage is 46 years. Lifespan assuming 3.0 hours per day usage is 2.3 years. 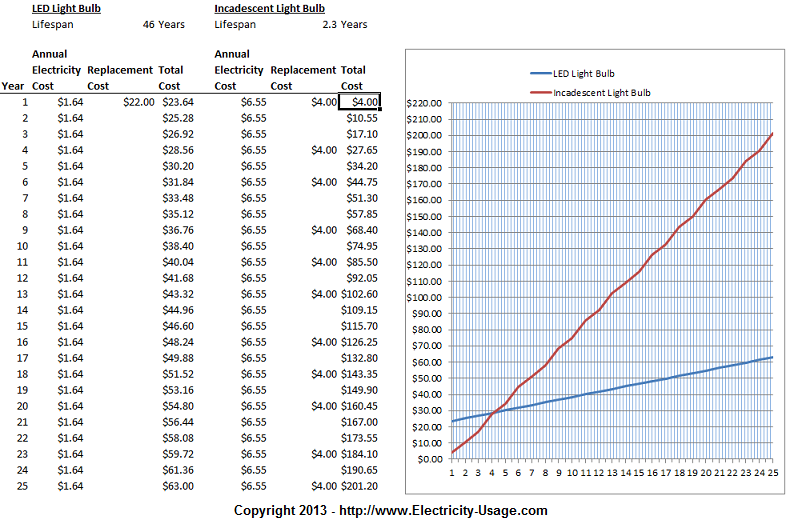 The graph below charts out the electricity usage costs, as well as light bulb replacment costs, over a span of 25 years. On the chart below, the left axis is total cost. The bottom axis is years. The red line is the cost of the incadescent light bulb. The blue line is the cost of the LED light bulb. The chart and data assume a stable electricity cost of $0.10 per KWH, and 3.0 hours of use per day. 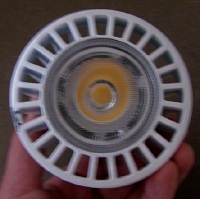 Comparing the light from the two light bulbs, the LED bulb is brighter, at 725 lumens. The focus of the light from the LED light bulb we used is more direct than the incadescent, and the light color itself seems ever so slighly more blue. Right after just 4 years of use, the LED light bulb has paid for itself, and the incadescent light bulb has already burned out and had to be replaced. 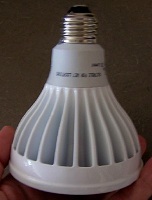 At 10 years, the LED light bulb has saved $50.00. If electricity costs go up, the savings is greater. We doubt that the cost of incadescent bulbs is likely to go down, and would increase by inflation and potentially by the levy of additional taxes. 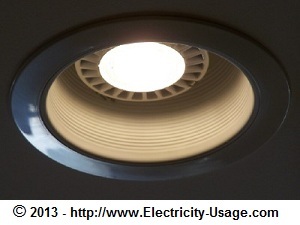 However, as more and more LED light bulbs are manufactured, their cost is likely to go down! Any way you cut it, investing in LED light bulbs looks to be a wise move long term.